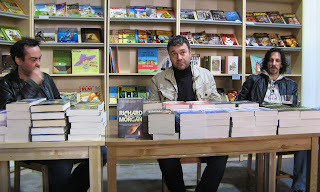 The talk at Plan B books in Glasgow city centre went really quite well, and it was also an opportunity to catch up with Richard Morgan, whom I hadn't spoken to in a couple of years. We had a good, decent-sized audience, and there was a mixture of faces both familiar and new; unfortunately I had to dive out for twenty minutes immediately following the talk, and it's possible I didn't get the chance to sign books for one or two members of the audience - sorry about that, if that was the case. You'd think it would be hard to fill up a full three hours just talking about writing, but it's surprisingly easy, actually, and between the three of us, with questions from Will Couper, who acted as our host, things rolled along rather nicely. Looks like an awesome event. 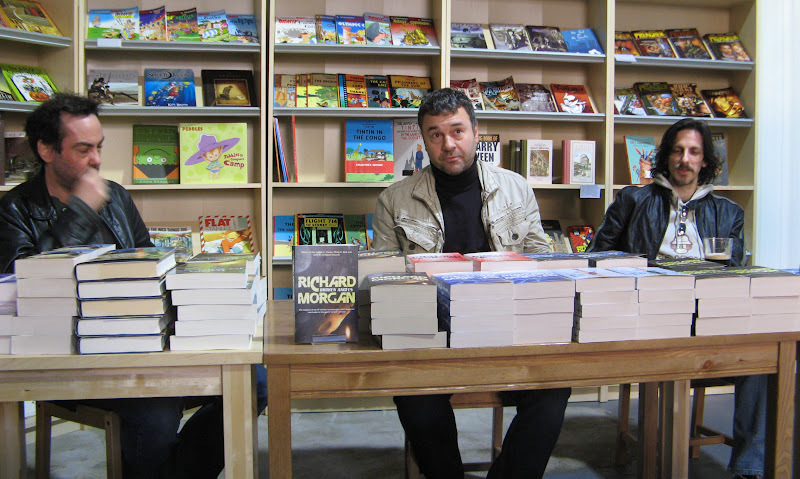 Between yourself and Richard Morgan I'd say you have written all of my favorite sci-fi, nice to see you know each other. Do you ever visit London to do similar things?